Want to turn your wellness game up a notch? 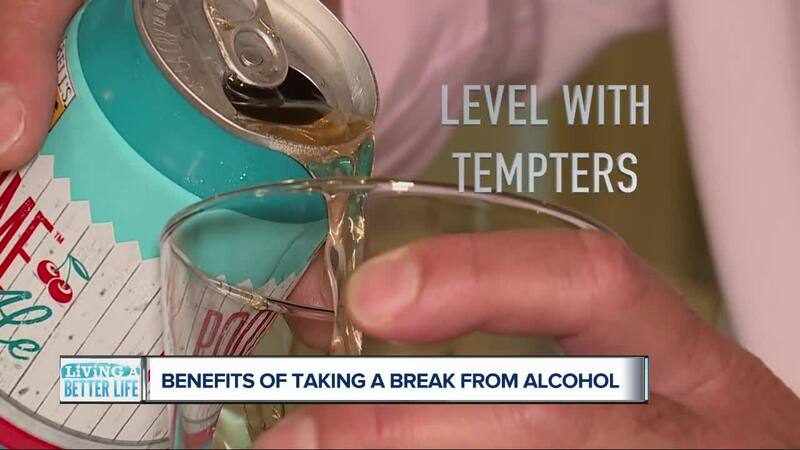 Experts say you should consider taking a break from drinking booze to boost your overall health. Whether you’re trying to lose weight, get better sleep, or be more focused, abstaining from alcohol could make a big difference. Maybe you have the occasional glass of wine with dinner or a cool brewsky with your buds. Or, heck… maybe you enjoy Great-Gatsby style champagne toasts with your closest friends and total strangers! Either way, you don’t find alcohol to be a problem in your life.If that’s the case…great! But some experts suggest you try cutting alcohol out completely for a while just to see how your body reacts. You might be surprised. Health and wellness expert Cassie Sobelton considered herself a “social drinker” – consuming one-to-two drinks a few times a week. But in November of 2015 on a solo trip to Thailand, she decided not to drink at all – mainly to keep her wits about her. And she felt phenomenal! That’s until she came home and broke her alcohol fast. “I actually had a couple of drinks one night and woke up the next morning and felt horrible. And I was like, 'What am I doing? I would really like to give this up.' And so I gave it up for a year. And after a year I never had a desire to go back, and it's been nearly three years now,” said Sobelton. Yes…she’s gone nearly three years without alcohol. And she doesn’t miss it. In fact, she says her life is better in a number of ways. "The biggest improvement was sleep…I had no idea I was having bad sleep,” explained Sobelton. Now she sleeps perfectly through the night. She also lost 10-to-12 pounds without even trying! She credits not consuming those 200-to-300 empty calories a few times a week with those occasional cocktails. "Now I notice [in the morning] I get up. I get going. I feel very productive. I feel very clear-headed. I have better relationships in my life,” said Sobelton. Her advice if you want to take a break from alcohol? 1. Define the amount of time you won't be drinking. Maybe it's 7 days or a month or a New Year’s resolution. Setting a defined length of time can help you focus your efforts. "In one week, you might not feel a real change. In one month, you will feel a real change. In a year, you will feel a huge change – [it’ll be] life-changing,” predicts Sobelton. 2. Don't share your plan. Having to talk about it all the time can wear on you and possibly weaken your resolve not to drink. 3. Level with tempters. Have a sit-down with people who notice you're not consuming alcohol and want to pressure you back into social drinking. Let them know you need their support -- not their temptations. 4. Find ways to be social without drinking. Opt for sparkling waters, Kombuchas, and non-alcoholic brews when you’d otherwise order a cocktail. Entertain with fancy glass bottles of mineral water or rich, sweet Italian soda. And grab a wine glass for sipping your alcohol-free favorites to fit in to the social occasion. Cassie Sobelton said when people would ask her, “Why aren’t you drinking?” She’d just say, ‘Oh, I’m just going to start out with water today.” And more often than not the conversation would move on with no more queries about what she was drinking. So, social drinkers, you can do this! Let us know how you’re “Living A Better Life.” Maybe there’s a diet or workout that has transformed you…or a relaxation technique that has helped you destress. We’d love to hear your story! Email Alicia Smith at alicia.smith@wxyz.com .